American cotton and American design come together to form the best patch in the world. 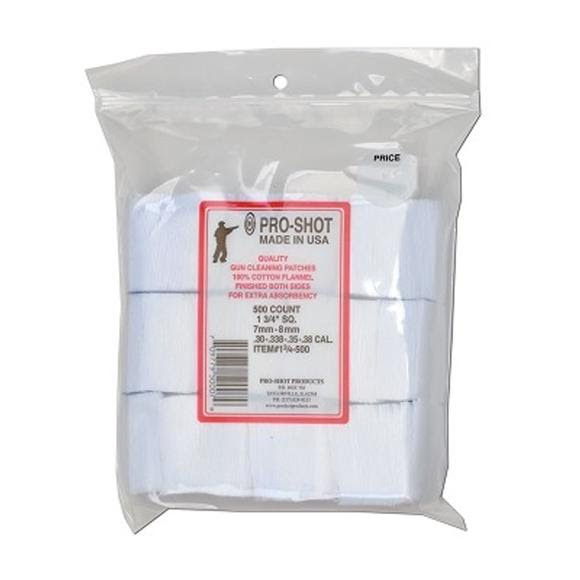 High thread count with tightly woven material along with Pro-Shot's double napped on both sides creates a superior cleaning patch that has become known worldwide for their unparalleled cleaning ability. Often imitated, never duplicated. American cotton and American design come together to form the best patch in the world. High thread count with tightly woven material along with Pro-Shot &apos;s double napped on both sides creates a superior cleaning patch that has become known worldwide for their unparalleled cleaning ability. Often imitated, never duplicated. The fact is well known that nothing surpasses 100% cotton flannel fabric fro purposes of absorbing foreign matter and residue, adn in turn carry it through the bore with the least amound of abrasive contact with the barrel&apos;s surface.